With nothing we need alter or unlearn. That you would give has always been a given. And just as unpretentious and unbidden. Which is the treasure of my love for you. As I opened my computer this morning, I saw a story that, once again, touched my heart deeply; a 24 year old son doing an interview pleading for knowledge about his missing mother. As the tourist season on the Grand Strand in South Carolina is preparing to open, with headlines about all the latest attractions, we have forgotten a story that one family lives with each and every day. It's reported that in 1990, Larry Hayslette, Andrea Hayslette's husband and father of her two children, was convicted of a charge of domestic violence against Andrea, an incident where he attacked her in the shower, held her hostage in a locked bathroom for hours, then tried to make her leave the home, still naked. She stated that Larry was often violent if under the influence of alcohol. In 1993 Andrea Hayslette was a straight A student at local Coastal Carolina University where she also held a part time job. She was married and the mother of two small children, a devoted mother, preparing for a career in marketing and communications, getting ready to take her final exams. One of the things in her regular routine was taking her two children to the library in Surfside Beach twice a week. By all accounts of both friends and family, Andrea would never leave her children behind, so to assume that she somehow walked away from her life doesn't add up. On April 24, 1993, Andrea was last seen by a neighbor at the Deer Track Villas in Surfside Beach where the family of 4 lived. By April 28, 4 days later, she was reported missing by her parents because it was not in her character to be out of communication with them for that length of time, and to be away from her two small children. Her truck and her van, along with all of her clothing and jewelry, were still at the home, but missing was her suitcase, toothbrush, her purse and other personal identifying items. When her parents returned from a trip to Disney World with grandson, Ryan, his younger sister, Katie, only 2 years old at the time, stated that "Daddy put Mommy in those bushes." Because of her young age, this statement was not allowed to be presented in court, but led investigators to believe that foul play existed and Larry Hayslette became the number one suspect. By May 24, 1993, a mere four weeks after Andrea disappeared, Larry Hayslette returned to his father's in West Virginia, returning to Surfside Beach one time after that to gather his belongings and move back there. Family court judge awarded Andrea's parents permanent custody of her two small children, a move that was definitely in their best interest considering some of the headlines we read today. Eventually, in 1995, Larry Hayslette was convicted of forging Andrea's signature on the title of her vehicle for the purpose of selling it, and in 1996 he was charged with Andrea's murder, however, the charges were dropped in 1997 for lack of evidence and this case has grown cold over the years. Here we are today in April of 2012 still without answers or justice for Andrea Hayslette and her family. Along the Grand Strand we have a couple high profile, nationally known, missing persons. Alice Donovan's case came to a close in 2009, 6 years after she was abducted from Conway's WalMart parking lot, when her remains were finally found, and Brittanee Drexel who vanished from an Ocean Blvd. hotel while on Spring Break in 2009, yet we haven't heard much about Andrea Hayslette and the circumstances surrounding her case. What can we in our community do to help find the answers? With so many advances in technology in the last 19 years, including DNA and social media, we can do a lot to at least bring the name Andrea Hayslette back into the forefront. News pieces like the one today from WPDE, Carolina Live, helps tremendously, it's this piece that brought my attention to the case, and I'm sure there are others in the area who were not aware of it before. Registering the case with a missing persons organization like CUE Center for Missing Persons located in Wilmington, NC,also raises the awareness level and continues to educate the public on the fact that she is still missing, and offers advocacy for the family and for the case. The family can continue to make noise publicly and on social media networks to bring awareness back to the investigation. Clues are there, we just need to find them, and to assist investigators in bringing a resolution and justice for Andrea and her family. Over 19 years memories tend to lapse, but someone knows something and has been living with it all this time; hopefully they hold the key and will come forward. Missing Adults Found Alive: What's the Appropriate Reaction? 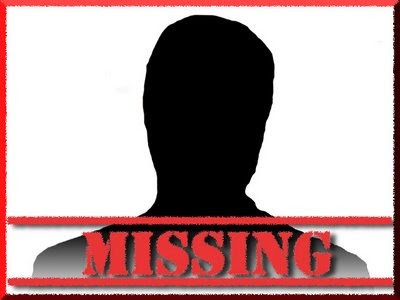 The reasons adults go missing are as vast as the ocean; foul play, homicide, abduction, and in some cases an adult walks away, abandoning their family, children and friends. But, what happens when a missing adult is found alive and what questions are they, or their family, obligated to answer, and to whom? There is no law that says an adult can’t walk away from their family, their job, or everything they once held dear, and create another life somewhere else. Is it the right thing to do? It depends on who you ask. While a family is devastated when someone walks out with no warning, no goodbye note, no clues as to what happened, an adult still has a legal right to do so. Morally and ethically, it may not be the best choice, but, there again, no laws have been broken. Several cases have made national headlines; we all remember the “runaway bride,” Michelle McMullen and others, and recently a case of a 19 year old college student, Aisha Kahn, whose family reached out for help and received media attention, the aid of missing persons advocates and organizations, and the hard work of local law enforcement. Found alive and well, she’s got a lot to answer for, but to whom? Me? You? The media? The public? The “ugly” rears its head all over the social network sites clamoring for justice, screaming for answers, and the “professional pundits” fuel these debates, the “yeas” and the high fives surrounding some of their opinions and comments, at the least, tasteless, and at the worst, shades of lynch mob mentality. Looking for appropriate answers is one thing, but wanting to dole out punishment is another, that's up to the law enforcement agency in charge. So what exactly is our society’s fascination with passing judgment? Many are demanding answers, repeating that the attention and resources given to finding these adults takes away from the “truly” missing. What a stupid statement. What if it was YOUR missing adult, would you expect less, or would you expect every resource known on earth to be expended for your loved one? And, if that husband, wife, sister or brother suddenly reappears, for whatever reason, would you feel your “taxpayer” dollars were spent unwisely? Prayers are never wasted. At a time when a loved one goes missing, sometimes that’s the only thing families can rely on. To see those of all faiths come together to pray for a safe return is a display of unity of mankind that doesn’t happen very often. The boundaries are erased and people embrace for a common cause, regardless of race, religion or ethnicity. It’s after a missing adult suddenly reappears that all the unity is forgotten in an instant, and if the media gets hold of the story, the pundits start shouting about the wrongs that have been done, and what they think should happen to this person. If the adult hasn’t broken any laws, there’s nothing to shout about, and if they have, then it's up to the local legal community to investigate and bring charges, not America's media commentators. If there is information that needs to be made public, they should have all the facts to back up what's put out there before the cameras start rolling, or fingers start twittering! The return of a missing adult becomes an accountability issue to their left behind family, law enforcement, and those whose resources were used to find them, not me, and not you, they owe us nothing. How we can be critical when the prayer to find a missing person alive and well is answered? Do they realize the alternative? The circumstances surrounding an adult who goes missing may not be what we would like or expect, but, until there are laws in place prohibiting adults from walking away from their families, it's none of our business. Celebrate a life spared and pray that whatever happened to precipitate any adult who feels they need to walk away from their life is rectified fairly through their family or through the legal system, not through public comments. And, yes, this is my opinion and I welcome yours! Intimate partner violence may have played a part in the recent disappearance of Nicole Fields from Orlando, Florida on Thursday, November 4, 2011 after attending a 9 a.m. hearing at the Osceola County Courthouse. She had attended a custody hearing trying to get back child support from Steven Louis, her estranged boyfriend, and has not been seen or heard from since that time. A strange twist, Steven Louis was found in Key West, FL driving the vehicle belonging to Nicole Fields. As police were in pursuit, Louis crashed the car and is now hospitalized with non life threatening injuries. He will be questioned about circumstances surrounding her disappearance. Louis had a 2008 aggravated domestic violence charge, which was later dropped. Family members of Nicole Fields admitted to reporters that Nicole was the victim of that charge. She had other incidents of violence at the hands of Louis, at one point taking out an order of protection. According to news reports, Fields' mother called the Sheriff's Office early Friday morning. She became alarmed Thursday when, for the first time ever, Fields did not pick up her two daughters from a babysitter and did not answer her cell phone. The family is certain Nicole Fields is in grave danger. Nicole's mother, Sherri, said her daughter regularly called her four to five times a day. But she hasn't had a call since Nicole went to the hearing Thursday. Nicole's family is taking care of her younger daughter, Kaliya, 2, who is Louis' child. Nicole's older daughter, Nyomi, 8, is with her father. Nicole Fields is described as a white female, approximately 5-feet-4 inches tall, 150 lbs., with waist-length blond hair and blue eyes. Anyone with information is asked to call the Osceola County Sheriff's Office at (407) 348-2222 or Crimeline at (800) 423-TIPS (8477). The estranged boyfriend of a missing Orlando woman helped lead deputies to an area where her dead body was found Thursday, Osceola County deputies said. Nicole Fields, 26, was found behind an abandoned house at 612 Robin Lane in Poinciana, deputies said. Deputies consider her death a homicide, but the cause has not yet been determined. Doing all the right things, friends and family of Karen Johnson Swift, are looking desperately for clues. Last seen by her husband around 1:30am on October 30, 2011, near Dyersburg, TN, her car was found approximately a mile away with a flat tire around 5:30am the same morning. According to news reports, her family says she is athletic, runs several miles per day, and could have been walking away from the car back to her home. Karen Swift owns a landscaping business and had plans made for future jobs, so it's unlikely that she was willing to walk away from her life, as well as her four children. "Authorities need anybody whom might have seen a 2004 White Nissan Murano between the hours of 1:30am - 5:50am early Sunday morning Oct. 30 in the Millsfield Hwy area or ANYWHERE in Dyersburg, Dyer County, surrounding counties, the Bootheel of Missouri and Caruthersville areas. In a 3 hour time span, of Karen's last unknown whereabouts NOTHING will be too small. If you can place her car on Millsfield Hwy earlier than 5:50am that helps narrow down the timeline. PLEASE share this and hopefully somebody saw SOMETHING associated with her vehicle somewhere here. Please call the Dyer County Sheriff's Department 731-285-2802 with that information no matter how small you think it is because it is still critical!" The Dyer County Sheriff's Office has been conducting aerial searches, and sent out search dogs on the ground sniffing for clues in the disappearance of the mother of four. Swift's SUV has already been sent to the TBI crime lab in Nashville for forensic processing. In an interview with her parents, Karen Swift's father, Gary Johnson says, "She is a great mom and works hard," Johnson said. "She's a sweet person, real nice, gets along with everybody." Swift's two sons are in college and her daughters are 7 and 9 years old. Johnson said his youngest granddaughter "just cries" and "won't hardly eat." Authorities report that Karen Johnson Swift and her husband are in the process of a divorce, he has been questioned in her disappearance, but at this time is not considered a suspect. According to Sheriff Jeff Box, "We don't have any evidence that would actually state that there is foul play but we don't have any evidence to state there's not either,' said Sheriff Box. One news report states that Karen Swift arrived at the home late Saturday night and "dropped off" her children. It also states that her husband spoke to her in the stairwell, then went on to bed. There are still many gaps in the story and questions to be asked, but, at this point in the investigation, authorities are concentrating their efforts on searches for Karen Swift and gathering leads. Anyone who has had contact with Swift, recalls seeing anyone near her vehicle since her disappearance, or has information regarding her whereabouts to contact the Dyer County Sheriff's Office at 731-285-2802. Dyer County, TN - The remains of a body found in rural Dyer County on Saturday have been identified as those of 44 year old Karen Swift. Swift has been missing for more than a month. Authorities had cordoned off an area of Harness Road near Highway 78 for most of Saturday afternoon and evening, where the decomposed body was found. The body was then sent to the Regional Forensic Center in Memphis for an autopsy and identification according to The Associated Press. "We plan to rely on dental records to help identify the body," Box told My Fox Memphis. Tennessee Bureau of Investigation Special Agent John Mehr confirmed late this morning that the remains have been identified as Karen Swift. Mehr told the Associated Press that authorities are treating the case as a homicide. Swift was last seen after picking up her daughter at a Halloween party in late October. The mother of four was last seen on October 30th and authorities later found her 2004 Nissan Murano on Millsfield Highway with a flat tire. 34-year-old Kyna Warren's family is sending a message to the mother of four who they reported missing Sept. 14, days after they last saw her. The family of Warren says they are falling apart since she went missing, but they are trying to stay positive. Michael Trahan reads the last text message he received from his missing daughter everyday. He hasn't heard from his daughter since she sent him the text message two days after she went missing that said, "I hope you get this...". "My heart was racing when I got the text, and when I texted back, 'Please get to a phone any other phone, just let us know you're okay.' and still no response," said Trahan. Trahan says he is trying to keep positive, but it's not like her to just disappear. "That's not her, she won't just run, not with the kids." The Beaumont woman left her four children with her mother on Sept. 7 while she went to visit a friend in San Antonio for her birthday. They or police aren't sure she even made it to San Antonio. A week passed with no word from Warren so they called police. "I'm about falling apart. I can't hardly sleep, completely worried. I don't know what to do," said Trahan. More than a month later, police still have no leads, and Warren's 15-year-old son Taydren Williams says he and his siblings are starting to share their grandfather's emotions. "I can't sleep that good, you now, and school is kind complicated... Like I said, I just pray," said Williams. Remaining hopeful, Williams sends a message to his mother: "Call us, you know. We doing everything we can to find you, and we just want to hear from you. Even if you don't come back, just call us, and let us know you're alright," said Williams. It's a message this family never dreamed they'd give. The family has really pulled together, posting flyers everywhere between Beaumont and San Antonio. They have made Facebook pages, and posted her picture on missing person websites. Warren is four foot 11 inches tall. She is about 115 pounds. She drives a 1999 purple Plymouth Breeze that's faded on the hood, trunk and top. The license plate number is BL1X221. Anyone with information on Warren's whereabouts is asked to call the police department at 409-880-3865 or Crime Stoppers at 409-833-TIPS. The family of a Beaumont woman missing since September says she called Thursday to say she was alive and safe. 34-year-old Kyna Warren was reported missing Sept. 14, just days after her family last saw her. The Beaumont woman left her four children with her mother on Sept. 7 while she went to visit a friend in San Antonio for her birthday; they or police aren't sure she even made it to San Antonio. Warren's grandmother Margie Trahan tells 12 News that she received a call around 7:15 Thursday morning from a woman stating that she was with Kyna and that Kyna was ok. Trahan says her granddaughter then picked up the phone, told her she had not been kidnapped and asked about her children. Trahan says Kyna Warren's father, Michael, traveled to Dallas, spoke to his daughter in person, and confirmed that she is indeed safe. Trahan says she does not know many details about where her granddaughter has been for the past two months, but she is just happy that Kyna is safe and will soon return to Beaumont. On Saturday, October 29 at 10am family members of the missing, along with members of the community, law enforcement, media and speakers will gather at Chapin Park at 1400 North Kings Highway in Myrtle Beach. South Carolina has approximately 125 known open missing persons cases, some recent and many that have gone cold. ImaginePublicity hopes to add to the awareness of each of them by hosting a stop along the CUE Center for Missing Persons’ Road to Remember Tour in Myrtle Beach. Each year CUE Center for Missing Persons hits the road across several states in order to bring awareness to communities of the magnitude of a silent epidemic, missing persons. This year’s tour will cover the following states: NC, TN, SC, TX, MS, AL, FL, LA . Every year, Monica Caison and representatives from CUE travel a different route in order to bring needed attention in the media and each community. The annual tour was created to generate new interest in cold cases of missing people across our nation. The inspiration came in 2004 from the case of North Carolina college student Leah Roberts, who had gone on a cross-country trip of self-exploration. Her wrecked and abandoned vehicle was found, but Leah is still missing. Leah’s case went cold and interest faded until CUE Center volunteers set out on a grueling 14-day trip to retrace her route and inform the media of all those who were missing in the path of the tour. In the years to follow, it only seemed right to keep hope alive after families across the country voiced the need for more help and supported the tour idea. 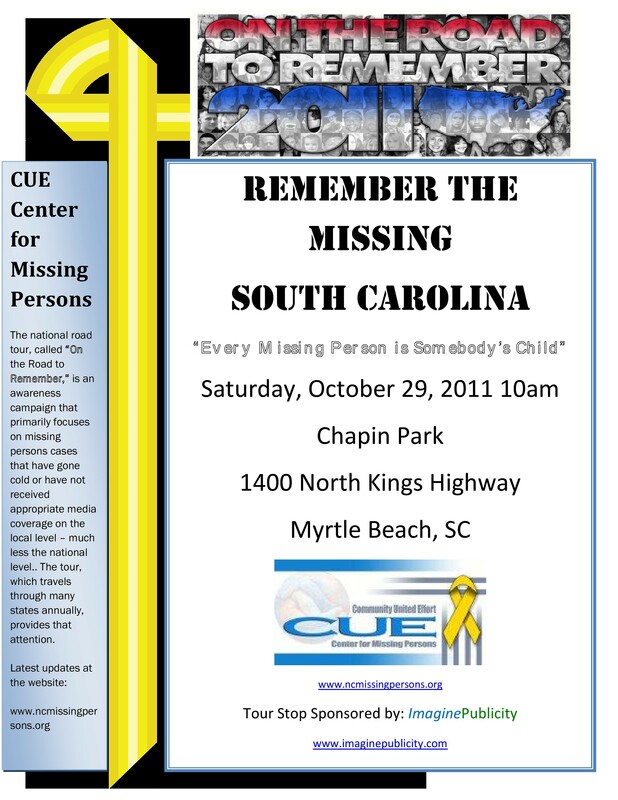 All families with missing loved ones in South Carolina are invited to participate. Please bring pictures, signs, banners, or whatever you like, to honor your missing loved one and bring more attention to your loved one’s case. If you are planning to attend, please email contact@imaginepublicity to give us an idea of who will be in attendance. Your missing loved one will be honored regardless of attendance.